The year 2002 seen the Mercer County Agricultural Society celebrating the 150th Anniversary of the first Mercer County Fair. But, it will not be the 150th County Fair. Mercer County Fairs have had a uneven history. The first fair was held in 1852, a one day event. There were again one day fairs held in 1853, 1854, and 1855. After that was a period of twelve years when no fairs were held, 1856 – 1867. Then, in 1868 the Agricultural Society reorganized and announced that after a long lapse they planned to hold the First Annual Mercer County Fair. The Fair was to be held in the beautiful grove adjoining the Reservoir near Celina. The Fair was to be held on October 14, 15, and 16. The Society then started counting the “annual” fairs from that year. That would make the 2002 Fair, the 135th, except there were no fairs held in 1932, 1933, 1934, and 1949. 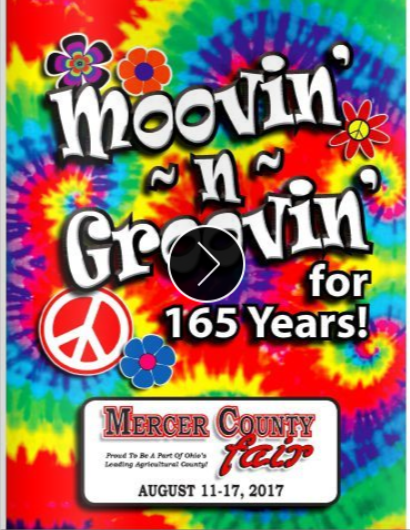 So from the year of reorganization, the 2002 Fair will be the 135th held in Mercer County. Now, does all of that make sense to the reader? One thing is for sure; the year 2002 is the 150th Anniversary of the first Fair held. Fairs go back a long ways in Ohio history. Besides being one of the big social events of the year in many counties, they also were created to find and reward the best agricultural products and techniques. The first Agricultural Society in Ohio was founded in 1818 in Trumbull County. Ashtabula County claims that they held the first Agricultural Fair in 1823. Geauga County still lays claims to having the oldest continusus Agricultural Fair held in Ohio. Historically speaking, the first Ohio State Fair was hel at Camp Washington near Cincinnati. It was sponsored in 1819 by the Cincinnati Society for the Promotion of Agriculture, Manufacturers, and Domestic Economy. From the earliest days fires were always a big danger at the early fairs and fairgrounds. The buildings and grandstand were made from wood and there were many open fires for cooking at the fairs. As a result, the early years saw many fires at the fair sites. This was something that was also seen at the Mercer County Fairgrounds. There were also serious calamities that affected most fairs over the years, such as; the Civil War, World War II, the Great Depression, and the polio epidemic. These also had an effect on the local Fair. Mercer County did continue the Fairs during World War II. The war ended during the 1945 Fair. It was reported that when the announcement was made, so many people threw their ration tokens and food stamps into the air that it looked like flying confetti. The story of the county fairs began in Ohio in 1846 when the Ohio Legislature created the Board of Agriculture. Very successful district fairs were held in Wilmington in 1847 and Xenia in 1848. It was in 1847, that the Mercer County Agricultural Society was first formed. After seeing the success of the district fairs, the first official Ohio State Fair was scheduled for September 1849. It was not held; an outbreak of Asiatic Cholera forced its cancellation. Finally, in 1850 the First Ohio State Fair was held outside of Cincinnati. It was a two day affair. Admission was 20 cents, and the two day affair had an attendance of close to 30,000 people. The Grange, founded in 1867 as the Patrons of Husbandry, also contributed to the betterment of agriculture. The fair was then revived in 1868 with “The First Annual Mercer County Fair.” From then on the local Fair took off and grew in popularity. The fairs were all held on the grounds bordering the lake. In 1878 The Agricultural Society purchased land that is now a part of the present Fairgrounds. The first Fair was held there in 1894. Later the Society purchased more adjoining land. Eventually, one of the best regulation tracks for horse racing was built. A large amphitheater was also added to the south side of the track that would seat up to 4000 people. When the fair was revived in 1868, it was developed into a three day event. In 1876, it was expanded to four days. In 1886 because of bad weather an extra day was added for the first five day Fair, but that was for only that year. In 1899 the first five day Fair was held. After that some years it was held ofr five days, and at times because of finances or problems it was cut back to four. But it gradually expanded into a full week event. Because of finances or lack of finances during the Great Depression there were no Fairs held in 1932, 1933, and 1934. Then in 1935 the Celina American Legion took over and ran the Fairs through 1939. With the programs developed by President Franklin Roosevelt to help the unemployed a new grandstand was built. This was done through the Federal Emergency Relief Administration (FERA). World War II quickly brought an end to the Great Depression, and after the war, the popularity of the Mercer County Banner Fair took off again. The first organized 4-H Club in Mercer County occurred in 1920. By 2001, ten of the 35 organized clubs have been active for 45 years or more years; Chatt Chums have been active for 68 years. In 1952 the Fair celebrated the 100th Anniversary of the first Fair held in 1852. Many special and new events were carefully planned, but very heavy rains and wet and muddy grounds cut into attendance. Today, the Fairgrounds consist of about sixty acres of land and thirty buildings. Many of the buildings are used all year. The Fairgrounds has also developed camping sites that can be used for a small fee. After 150 years of stuggling and then success, the Fairs go on, and the improvements of the events and the Fairgrounds, also goes on. This overview has references from the Agricultural Society Secretary’s files of Ginny Miller and Ruth Myers, and artibles by Pat Petzel (Buckeye Farm News, June 2000) and AAA Magazine (Home and Away, July/August 2000). In the history, the specific newspaper articles are given a reference and date. Permission to use the newspaper articles, in the history book, was given by Frank Snyder, Daily Standard, Celina, and Robin Link, Mercer County Chronicle, Coldwater, Ohio. The Western Standard, Mercer County Observer, Mercer County Standard and Der Mercer County Bote newspapers were also used. The newspaper microfilm can be found at the Coldwater Library and the Mercer County District Library.